Sometimes, it seems like children are determined to find a way to injure themselves. Luckily, you'll find a wealth of child safety devices designed to keep kids safe, whether they're used while driving in the car or to prevent accidents at home. Using safety devices properly is key to making sure your child isn't hurt. Electrical outlets can provide a dangerous shock for your little one if a finger or other object is inserted into the power slot. Using outlet covers can prevent this; usually they are easy for an adult to use if the outlet is needed. 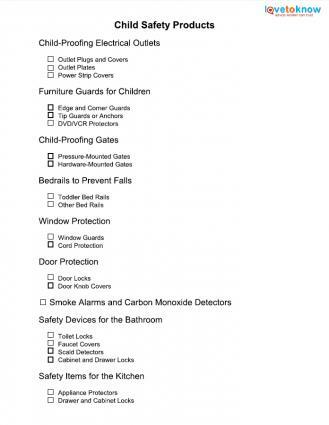 There are several types of child-proofing items that can be used on outlets. These are the outlet covers that most people are familiar with. You insert this two pronged plastic piece into the specific outlet. These can also be called caps. There are also covers that can fit over any plug that is in use in the outlet while keeping little fingers out. 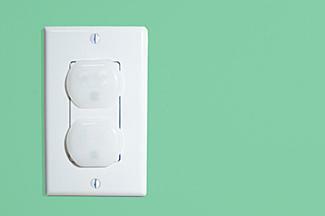 These devices can be installed on the entire wall plate and look like a typical outlet plate. However, these have some mechanism that blocks little fingers but allows you to insert an electrical plug as needed. Some versions come in different colors to match your décor. Others have swinging covers for each outlet hole and allows you to use one part at a time while the other outlet stays closed. Power strips have multiple electrical outlets that could be dangerous. Power strip covers guard the plugs from curious children but still allow you to use the outlets; these covers may also be adjustable to allow you to insert larger plugs like chargers or computer plugs. Your household furniture can be dangerous for a crawling child. Sharp edges or tipping dressers can significantly injure a baby, so you should install safety items to lower this risk. There are a number of items that can baby-proof your furniture and electronics. To protect your child's head or eyes from sharp corners or edges, you can install edge guards on low coffee tables or longer cushions on shelves. Expandable table protectors that encircle the table edges are also available in several colors. Curious children can tip over televisions, dressers, bookshelves, or other furniture items. Installing anchors that make it difficult to pull these items over can protect your child and your furniture investment. These can be straps or brackets; both can be used to prevent tipping. The weight of the furniture may also impact the type of - or number of -- brackets or straps that you use to prevent falls. Locks to protect your flat screen TVs from tipping are also available. Fingers or other items like toys or sandwiches can be placed in VCRs or DVD players. To keep your child from placing items into your family VCR, you can purchase a clear cover that allows you to use your remote control normally. 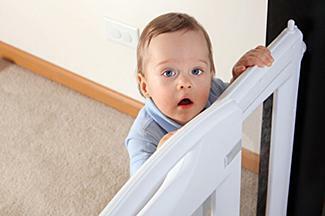 To a crawler or walker, the stairs may look like the next frontier but unfortunately, the staircase can be the cause of serious injury or death. To prevent unplanned trips down the stairs, you should install gates at the top and bottom of the stairs. There are two types of gates - pressure-mounted and mounted gates. Gates can also be used to block access to other rooms or to limit the area the child can play in. Since some doorways are large, you can purchase extensions to make the gate longer. This type of gate is not attached to the walls. This means that it is not sound enough to use at the top of any staircase, but it can help with doorways and hallways. These are bolted into the frame of your house or your staircase. These are sturdy enough for the top of the stairs. Once your baby stops sleeping in a crib, you will want to keep your child from falling out of bed or getting out if you don't want him to. No matter what type of bed you are using, you can install bed rails to protect your son or daughter. The wall is not a good substitute because the child can get stuck between the wall and the mattress or box spring; it is better to have a rail on both sides of the bed. Some rails are created for toddler beds. You can select one to match the finish of the bed, including wood. Other rails are adjustable and can fit twin, full, or queen size beds. There is an inflatable bed rail as well that can be used on twin beds for children up to 24 months. This comes in different colors and patterns. Falls from windows are common especially during warm weather, and cords from blinds can also present a strangulation hazard. You can baby-proof your windows with some helpful products. A window guard is a barrier that goes across the opening that can keep your child from tumbling out. However, for windows that are on the 6th floor or lower, the window guard needs to be able to be easily opened by adults and older children in case of fire. These guards come in different sizes for different styles of windows, and the bars should be around 4 inches apart. Some guards can be used for both vertical and horizontal windows. There are also services that can help you determine what type of windows you have in your home so that you can buy the right sized guards. If you don't want to use a window rail, you can still keep child from falling out of a window using window stops. These stops keep the windows from opening wide enough for a child to fit through. Blinds can also be a temptation for children and may lead to strangulation with the drawstrings. Several companies sell devices that shorten the cords or that keep the cords out of your child's reach. You can also order special blinds that are cordless so that there are no strings for young children to pull. Protecting little fingers from being pinched by slamming doors or in bi-fold doors is another reason to install safety devices. There are a couple of ways you can do this, depending on the type of doors you have. Bi-fold door locks can be used on closet and pantry doors to keep kids out; other types of door locks can be used on typical doors to keep kids in and to keep the door from slamming on someone's fingers. Another way to prevent a child from opening a forbidden door are door knob covers. Adults can use them without problem, but they are more difficult for a child to grip. If your doors have a lever-style handle, you can still childproof them using a lever-style lock. 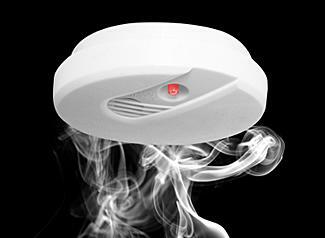 Another important key in protecting your home is to install smoke alarms and carbon monoxide detectors. You need to install these throughout the house - including in or at the doorways of your children's rooms. It is also important to check these each month to make sure they are functioning properly. The bathroom contains a number of dangers for small children. Drowning, scalding, bumps, and poisoning are all risks in this room, but safety products can help. Children are attracted to water, and it's easy for toddlers to open a toilet lid. To prevent a child from drowning in the toilet, you should install a toilet lock. To protect the child from bruises or cuts, there are faucet covers. These come in several entertaining shapes like hippos or elephants. Scaling from too-hot bathwater is another danger. While you should adjust the water temperature in your home to 120 degrees F to lower the risk of burns, you can also purchase anti-scald detectors to warn you if the water is too hot. Depending on the types of cabinets or drawers that you have in the bathroom, you can get latches to keep inquisitive babies and toddlers out of potentially dangerous cleaning supplies or medicine cabinets. You can also select a special medicine chest to keep your medicines in so your children can't get into them. Between the fragile glassware, hot stove, cleaning products, and sharp implements, the kitchen can also be quite a risky room for little ones. Luckily, there are a number of products to make things safer. Kitchen appliances can be hazardous for babies and toddlers, but several products are designed to help. Stove knob covers can keep the child from turning on the oven or stove top. Another item to protect your children is a stove guard which is a piece of plastic that prevents a child from touching the hot stove eyes. Additionally, latches can be installed on the doors to keep children from raiding the fridge. Adults can easily unlatch them to gain access to the food. Convertible locks can deny access to any appliance in the kitchen. Cabinet latches can keep kids out of the pantry or cabinets. While pools are very entertaining and fun, they are huge hazards for children. If you have a swimming pool at your house, you should consider some of these safety products. 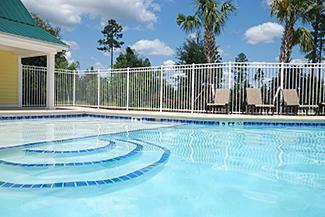 All hot tubs and pools should be surrounded by a pool fence. Most pool fences need to be professionally installed; however, there are some that come with instructions and tools to allow for home installation as well. Some fences even comes in a variety of colors to match your yard décor. Although pool fences are important for any pool, the Consumer Product Safety Commission suggests that you also add a pool alarm and an alarm on the door to the pool to let people know that a child, a pet, or a trespasser has gone outside. Keeping the pool covered makes it less tempting to little ones. An automatic pool cover can also be part of your pool protection plan. Print your own shopping list! There are a couple of other items that you can buy to enforce child safety. Be sure you also invest in these important products. One of the first safety items all moms and dads will use is a car seat to transport their new baby home. Car seats aren't a luxury; they're a requirement by law. Studies have shown that fewer children are injured or killed in car accidents when car seats are used correctly. Be sure and check with your state to see what the age and weight requirements are for car seat use. Usually, once a child reaches a certain age, a booster seat is acceptable for car riding. These allow you to listen to your infant or child while you are in another part of the house. Monitors have so many different features including video and portable hand units so you can listen on the go. While many child safety devices exist to help parents, none of these take the place of proper supervision. Knowing that your child is naturally curious and will want to explore will help keep your frustration level down when he does something that puzzles you. Keep your child free from injury by taking steps to keep harmful substances and items out of his way. If you need help downloading the printable shopping list, check out these helpful tips.